In the past, I’ve often looked at my garden and wondered “where do I even start”. I loved plants and flowers and bought lots of them, but my garden never looked ‘put together’. I wanted to improve the look of our garden but I never managed to do so. Sure, the odd flowering plant here and there brightened up a boring corner. But the look of the whole garden never made me proud to call it my garden. After we gave our garden a major make-over, I now know where I’d been going wrong. The way to improve your garden is to create balance and structure. And there are easy tricks you can use, even if you’re not a gardener or don’t know where to start. Unless you already have a beautiful garden, your garden is likely a space that’s practical. It can be untidy at times. Or you don’t use it at all and it’s tidy but unloved. Maybe you have a small town garden with a washing line and your kids’ toys scattered around. Or you have a large back garden with a huge lawn and shrubs either side but no real ‘wow’ factor. Whichever garden you have, there are ways to make this space look better. A typical garden is a space with plants or lawn or shrubs placed randomly within the boundaries. It can look ok but you can improve this by either providing balance or symmetry, and a focal point. Formal gardens are symmetrical. This means that if you visually divide your garden in two halves, both sides look the same or similar. They are like a mirror image of each other and have clear structure and geometric shapes. There are some gardens that have implemented this type of design on a large scale. These are formal gardens. Of course they are on a grand scale and I know our gardens are not usually that size. But we can apply the same rules in our own small gardens. What do they all have in common? They all have a focal point. The eye leads towards a certain point in the distance. And they are the same on both sides, they reflect left and right, they are symmetrical. Most gardens look better after a good tidy up. If your garden is already tidy, think of ways to further improve it. Tidy the edges of your lawn and give the garden a good weeding. If there are toys lying around, get the kids involved and make it into a fun game. Find a place where you can store any unused items and get everybody to put as many items away as they can. If you have items in the garden that haven’t got a home elsewhere, think about recycling them. Or give them away if somebody can use them. Most of us have things in our garden that we never use but we get used to seeing them there. We don’t even notice them anymore. Think about getting a rotary washing line or one that you can put away after use. Washing lines can often spoil the look of a garden but you can put them in a more discreet position. After giving the garden a good tidying, stand back and take a good look over the whole garden. Where do your eyes get drawn to the most? 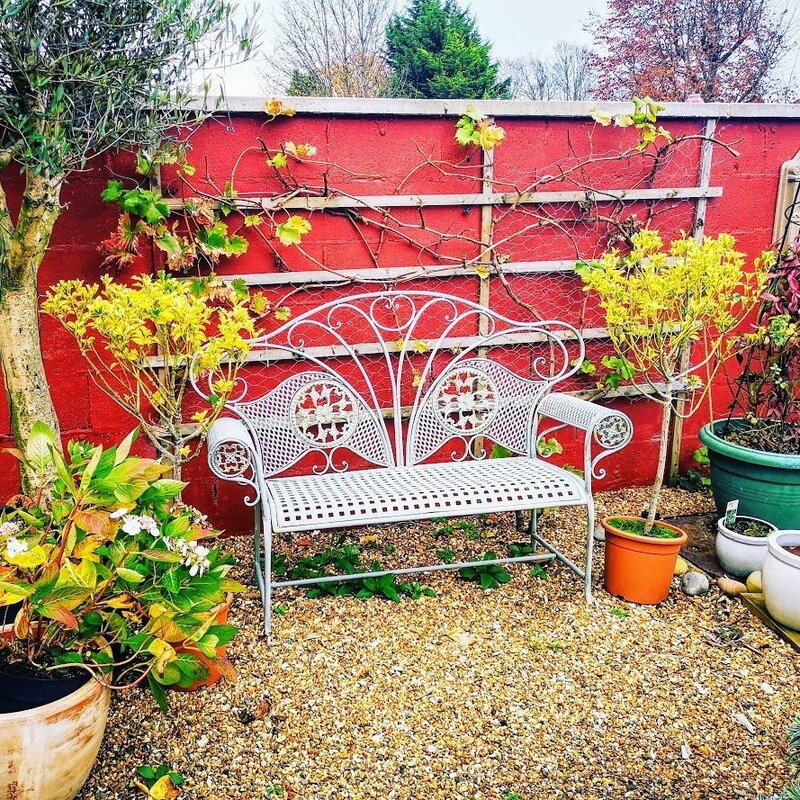 Is there a natural feature in your garden, like for example a tree or shrub, or do you have a garden ornament already? Focal points look very good at the end of paths. A bench or statue can make good focal points. If you haven’t got a focal point already, think about where you could place one. We have several in our garden: a sun dial and an arch at the end of a path, a bench, a water fountain and a wooden carving hanging from the fence. You don’t need that many, especially in a small garden, but even one will make a big difference. The easiest focal points are ones that already exist, like a tree or a pond. You can also have a large shrub or plant in a big pot as a focal point. 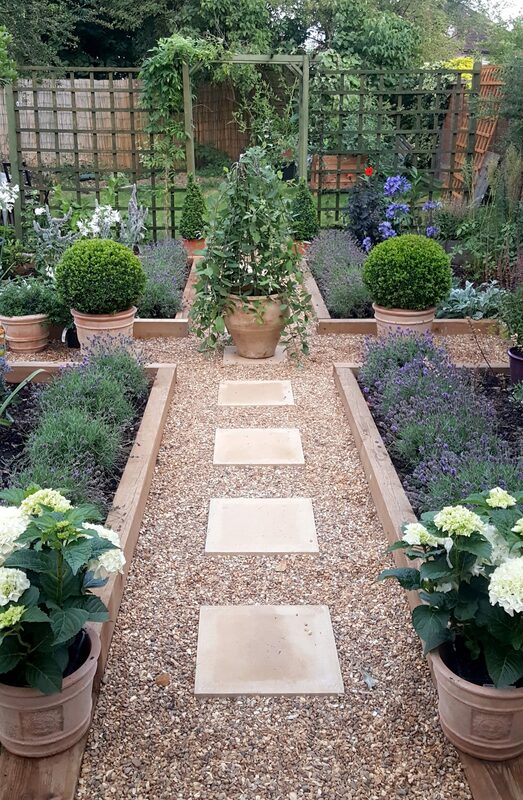 In this photo you can see we placed a small standard bay tree in a pot in the centre of our path. This brings the focal point closer. If we took away the tree, the focal point would be further away through the arch at the end of the garden. As you can see above, we have several focal points in our garden. You can use something you already have such as a bird feeding table or a bird bath. To achieve this, you need two large plants or shrubs in large pots. 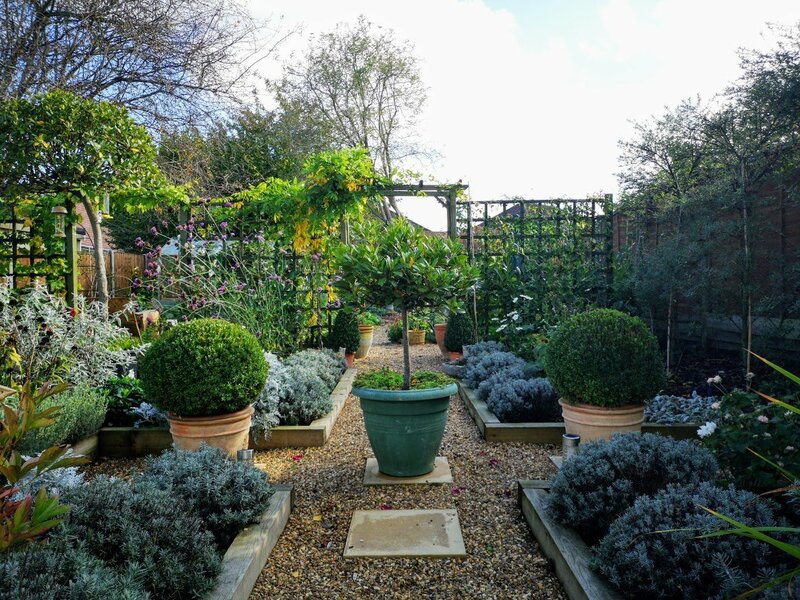 A pair of plants, like standard bays, standard olives or large evergreen shrubs, create symmetry. Even though everything else may not be symmetrical, a pair either side of a path or bed will create this illusion. If those plants are topiary or trimmed into geometrical shapes, so much the better. Notice in this picture we have used pairs of potted plants to good effect. There is a pair of white Hydrangeas in terracotta pots at the beginning of the path. There are two box ball topiary plants either side of the bay tree focal point. And two cone-shaped box plants placed at the bottom of the arch. We have used this principle of using a pair of plants in pots elsewhere in the garden. We keep swapping them around to keep things interesting. The advantage of using pots is that you can move them around to give your garden an updated look whenever you want. Great plants to use are: Standard Lavender, bay, rosemary or olives. Shrubs like Viburnum, box, laurel, Euonymus, and any evergreen shrub that can be shaped. We have used two standard Euonymus plants either side of a bench to good effect. The more pairs of plants you place around the garden, the better the effect. However, larger plants don’t come cheap. If budget is a consideration, you can buy fairly cheap laurel hedge plants and grow them either into a standard or clip them into a pyramid shape. It doesn’t have to be perfect. Other budget friendly ways to buy plants are boot fairs, yard sales, end of season sales and plant fairs. We have bought most of our plants from car boot sales and nursery sales. 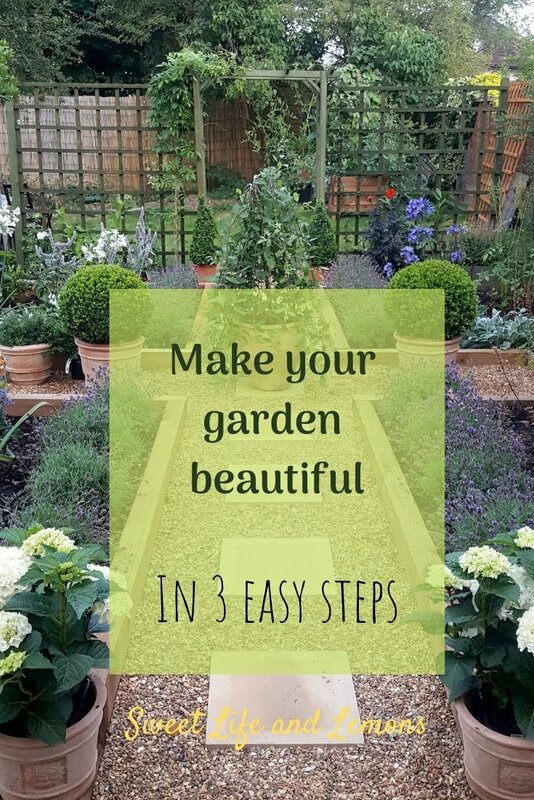 I hope these tips have helped and you are inspired to make some changes in your garden. Let me know what you think in the comments. If you have any questions, I will try my best to help out.